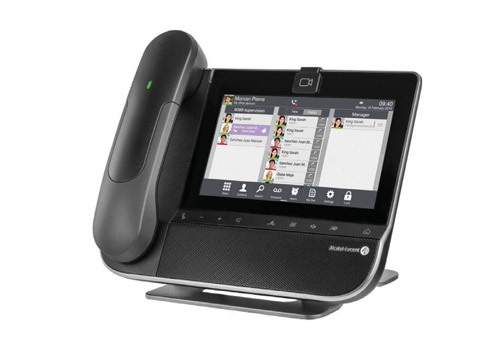 Its seven inch vivid touch screen, Bluetooth® handset and built-in camera offer a smooth multimedia user experience with outstanding wideband audio and HD video conversations. The 8088 Smart DeskPhone also has an HDMI® output for screen replication. It also has a dedicated video HD display on an external monitor, which provides an opportunity to transform any regular meeting room into a video-enabled conference room. Elegant design makes it a great brand advocate in main offices or branches that receive visitors. Outstanding HD audio quality is provided across equipment, including hands-free, handset, stereo headset and Bluetooth. Convenience provided by the award-winning OpenTouch Conversation® user interface enables simplified HD audio and video communications. Intuitive HD video: When at the desk, executives and managers enjoy comfortable business communications that can be escalated to HD video peer-to-peer or multi-party sessions with a single tap. The video display can be extended to an external HD monitor for more immersive video collaboration. The brightness is auto-adjusted for enhanced visual comfort depending on lighting (artificial or daylight). Wideband audio handset and support for earphones enable better in-building mobility and excellent audio quality.